Block paving is one of the most popular choices for driveways & patios and Just a Quote allows you to compare block paving prices from several installers. On this page and the related pages about concrete block paving, we will cover topics such as how the cost compares with tarmacadam and where you can use concrete block paving on driveways and patios. 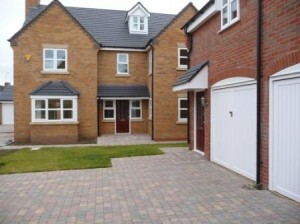 We will also examine in detail the different types of block paving, the various popular block paving laying patterns including the use of computer software in the design and the various stages of the block paving installation process. The white powder which sometimes appears on new block paving is referred to as efflorescence – we explain what it is and what you can do about it. Finally, we will consider the advantages and disadvantages of block paving, when permeable block paving should be used and how to clean and seal an existing concrete block paving driveway or patio area. Block paving, or brick paving as it is sometimes referred to, can include concrete, clay and stone blocks, each with their own with very different characteristics. Clay bricks and stone blocks have been used throughout history, whilst the more modern interpretation, concrete block paving, really only came into fashion and popularity in the 1980’s. The number of manufacturers has grown dramatically since then and the choice of sizes, textures and colours of block paving is now enormous. As with most home improvement products, there is not only a wide choice of products but also a large difference in quality and cost. If you find choosing a particular block paver for your driveway or patio area difficult, then the choice of company to install them can be doubly so. A cheap and poor quality block well laid, can often provide for a better driveway or patio area than an expensive, high quality block badly installed. Where possible though, it is always better to buy quality block paving products, as often the price of the concrete block paving itself is a relatively small part of the total project, probably no more than around 20%. Whilst tarmacadam prices have risen dramatically since the year 2000 due to the rising price of oil from which the bitumen in it originates, the cost of block paving has fallen due to the mass production techniques employed by the various manufacturers. However, whilst the cost of the blocks themselves has fallen, since stabilised and is now rising, the labour cost of laying them has steadily risen throughout the past decade. The situation now is that a basic block paved driveway or patio area is a similar price to that of a tarmacadam one for an average sized area, making block paving as relatively affordable as it’s ever been. Due to the machinery and set up costs, a very small area is probably less expensive in block paving than tarmacadam, whilst a very large tarmacadam area will probably be less expensive than block paving per square metre. 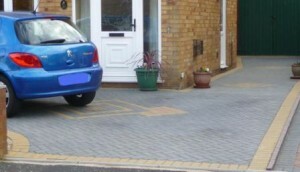 When pricing a tarmacadam driveway or patio area there is generally only one recommended specification (taking into account the proposed usage), or if companies suggest slightly different specifications, they will normally be similar. The price of a tarmacadam area is affected by the amount and type of drainage, any edging, kerbs or steps which are required, any decorative features and the amount of profit the contractor would like to make. Apart from the profit element, the situation is very different when considering block paving for the surface for your new driveway or patio area, due to the exceptionally wide range of products available from the many suppliers in the market. Everyone will be familiar with the standard block paver, as it is normally 200 mm long, 100 mm wide, either 50 mm or 60 mm thick and is available in colours which include red, black, buff, brindle, grey and gold. There are however, a wide range of different sized blocks, with different textures and colours including tumbled blocks with a multi-coloured appearance. Concrete block paving can be used on almost any outdoor surface where pedestrians and vehicles travel, though the sub-base specification will be different. Block paving can be installed on driveways, patio areas and foot paths in domestic situations but blocks are equally capable of a providing a durable surface for public areas such as pavements and roads, particularly in cul-de-sacs. Block paving is also used on the public highway to differentiate various usage areas such as loading bays, drop-off areas at airports and railway stations, as well as taxi bays. The type of block may differ from one area to the next and in high load areas both the thickness of the blocks and the specification of the sub-base will be greater. 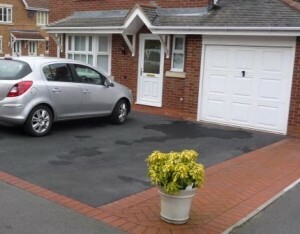 Blocks are also useful in conjunction with tarmacadam surfacing, not just as an edging restraint or a border but also to create a decorative feature which will break up a large area and stop a domestic driveway looking like a commercial car park. Also, blocks are sometimes used to mark out car parking bays in a commercial setting in place of thermoplastic white lining. Mixing different types and sizes of block paving together within the same area can provide an attractive surface if care is taken in the design stage, for example in large patio areas which may have several tiers down to a lower lawn. They can also be used to differentiate between areas for cars or pedestrians. The design opportunities are endless and constrained only by your imagination – though you must remember that the more complex the pattern, the longer it will take to install and the greater the labour cost. Most of the major block paving manufacturers will provide laying patterns for their block paving products which will also allow you to calculate quantities of the various materials required for your project. Some manufacturers offer these to be downloaded from their websites, whilst others have bespoke software to help with design and planning.